Create sessions and assign staff in seconds. Managers spend hours of their time manually scheduling staff on to sessions. This is valuable and expensive time that we help you save. A single source of truth. When there are multiple copies of the schedule being sent around, it’s unclear if what you’re reading is up to date. We remove confusion by providing one home for all scheduling. Find your last-minute saviour. Forget the frantic search for a replacement staff member when someone pulls out last-minute. Easily view who’s available and assign them to the session. Update easy. Plans change, we get it. Managers can easily edit sessions and, when they do, all staff are notified by SMS & email. Create sessions and assign staff in seconds.Managers spend hours of their time manually scheduling staff on to sessions. This is valuable and expensive time that we help you save. Easily create a ‘Single Session’ or a ‘Repeating Session’ and assign staff. ‘Repeating Sessions’ are sessions that will occur regularly throughout the season, such as weekly training. Add notes, such as a link to a training plan. Managers don’t want to be creating individual sessions for every Saturday game. That’s why we built Rounds. Quickly create multiple sessions for a round of sport. Use the spreadsheet built directly into Clipboard, allowing you to copy and paste fixtures from Excel. Share round details by easily exporting to Excel format. 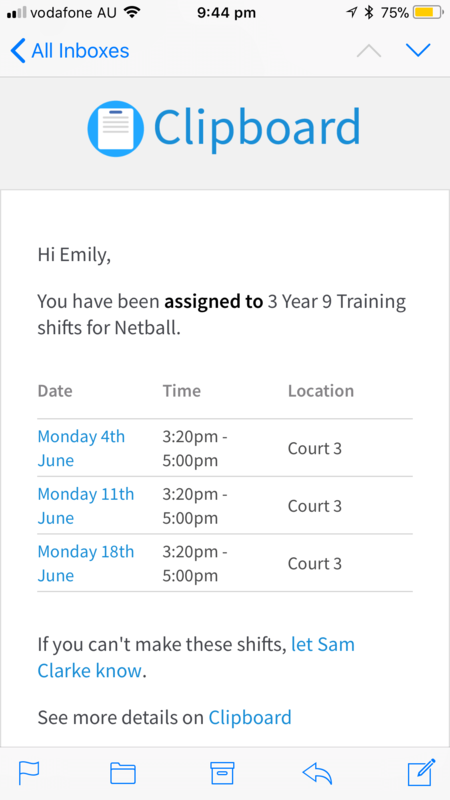 Choose between ‘staff’ or ‘students and parents’, allowing managers to pin the schedule to a noticeboard or upload it to Skoolbag. See everything in your calendar app. 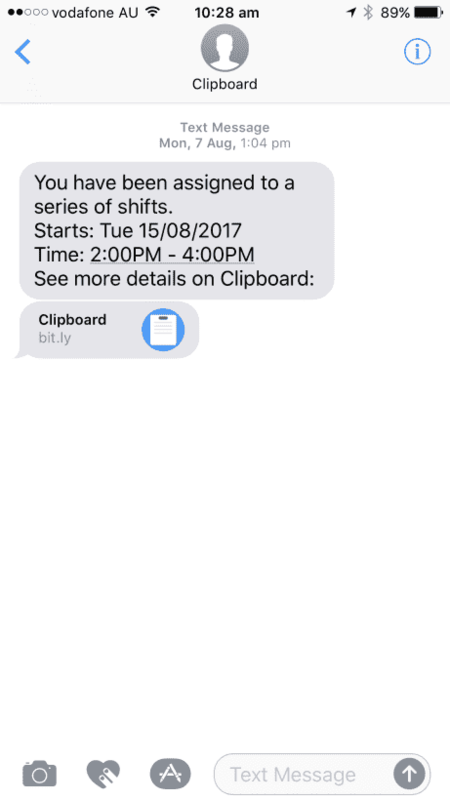 Your Clipboard schedule can be synced with your favourite calendar app - such as Outlook or Apple Calendar - at the click of a button. View all Clipboard events in your calendar on your phone or computer, without having to sign in to Clipboard. 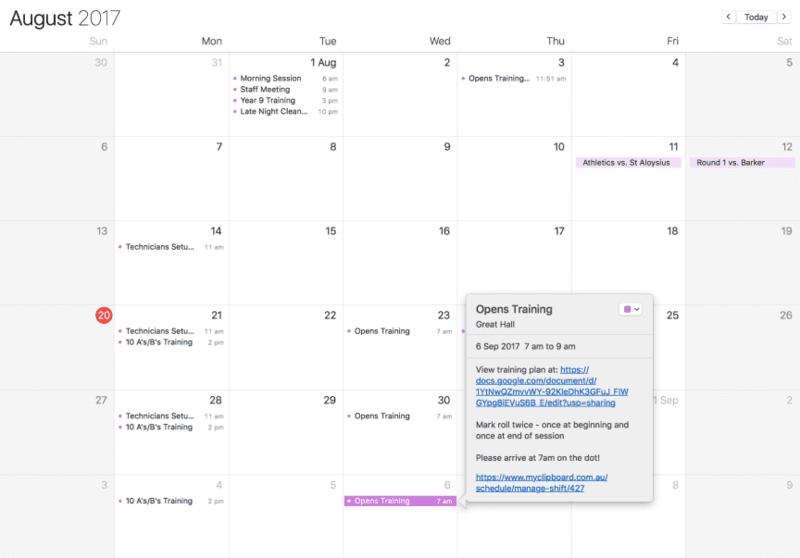 The calendar will auto-refresh, so it seemlessly stays up to date with any changes in Clipboard. "With such a large number of coaches, communication is vital. For instance, one coach can’t make a game and I’m texting people all over the place trying to get someone there! In Clipboard my staff can see who’s available and assign them straight away which saves us a lot of time, effort and stress."